Gouda is now one of the world’s most popular and widely produced cheeses created using a traditional recipe which calls for “washing the curd,” where some whey is drained after the curds separate then water is added. This method washes away a portion of the lactic acid to create a sweeter tasting cheese. 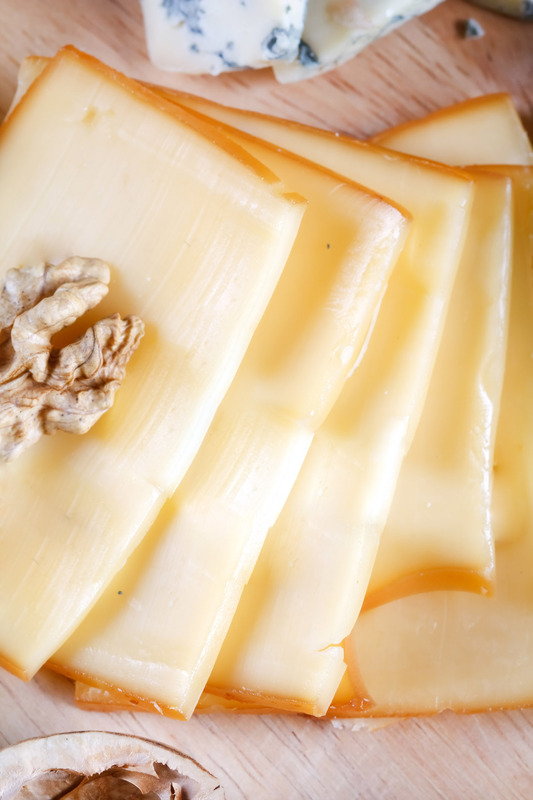 Sweet and smoky flavors make a wonderfully delicious match, so when good Gouda is carefully brick-oven smoked over smoldering hickory chips, the result is a delightfully distinct, crave stimulating combination. The edible brown rind holds much of the earthy, smokiness but the buttery, smooth, melt-in-the-mouth paste underneath has also been imparted with a lovely smoky taste. Application: Cylindrical shaping makes this Smoked Gouda Loaf an ease to slice. Always a presentable addition to any gathering, Smoked Gouda Loaf looks great on party platters, is excellent for impromptu picnics- or just an informal, anytime snack and adds character to the simplest or most gourmet sandwiches and burgers. It is also very popular for cooking and melts perfectly to provide variety for staple dishes like pizza, mac-and-cheese or quiches, is ideal for cheese-based sauces and complements fruit, nuts, meats (especially ham, bacon or smoked meats) and even dark chocolate. Pairing: Smoked Gouda pairs best with beer. Any artisanal beer works well, with brown ale being most preferred. When selecting a wine, stick with a white like Pinot Gris or a Sauvignon Blanc. 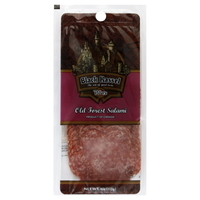 Steeped in European tradition, Black Kassel Old Forest Salami is true to the old-world taste of superior salami while being produced in one of the finest and largest new-world facilities in North America. Each unique flower-shaped black casing is stuffed with top-quality, lean ground pork and an enticing spice mixture, then gently smoked with secret hardwood blends before being naturally dry-cured with a legacy of practiced patience that dates back five generations. As stunning as it is delicious, Black Kassel Old Forest Salami is great for specialty cold cut platters or cheese tray paired alongside a Smoked Gouda.